Australia’s Northern Territory has three basic seasons – the wet season monsoon (usually late December to April), the dry season (May to September) and the stormy "build-up" – the time of increasing heat and humidity leading up to the wet season (late September to December). There is usually very little "build-down" from the wet season as the cool dry season south-easterly wind arrives almost overnight once the monsoon weakens. What does all this mean for barramundi fishing? Barramundi love heat. They bite really well in the build-up when it is warm, and they are preparing to spawn. But this can also be an uncomfortable time to fish unless you limit trips to the cooler mornings and afternoons, and at night. During the early wet season the weather is often cooler but barramundi can be hard to catch as the rivers flood and the fish spread out in the floodwaters. 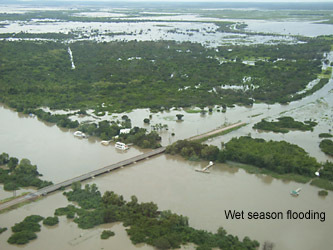 Towards the end of the wet season the fish tend to gather in certain areas, usually the mouths of floodplain creeks. This is the run-off season and it is a great time to fish. A wet season that drops rain consistently from December produces better fishing than a wet season that dumps it all in one lot late in February or March. Just after the wet season is the "greenwater" period where the rivers are full of greenish (clear by Territory standards) rainwater. This is a great time to fish because water clarity is good. Territory rivers are otherwise muddy and turbid. Once the dry season south-easterly hits, the water in rivers and billabongs begins to cool and barramundi slow down, however they can be caught right through the year, especially during warm spells. Barramundi fishing is therefore something you can enjoy all year. Successful barramundi fishing requires an understanding of northern seasons. Let’s start from January. It’s the wet season and the rivers are swollen. Barra are moving up the rivers and out onto the floodplains feeding on frogs, tadpoles, rainbow fish and the like. With so much water about, the fish can be hard to find, but anglers who fish inflows, junctions or eddies, or where bait is concentrated, will find barramundi. By March, the floodplains are flowing clear water into the rivers and sea. This is the “run-off”, when fishing is at its best. Barramundi can be found lurking at the floodplain creek mouths. The best fishing is usually as the floodplains empty their final contents. By April/May, when most of the floodplain-fed creeks have dried up, a strong freshwater flow remains in the big rivers, and barramundi are targeted in the clear green water. Trolling and casting to eddies and structure can work well, as well as working mullet schools on the incoming tide. In tidal waters, barramundi will travel up and down a river with the tide, providing short but furious action as they pass by. By June, as the upper rivers stop flowing, barramundi become landlocked in billabongs, where they become creatures of ambush, waiting in weeds, snags and rockbars for passing meals. Cold spells will slow them down. Successful anglers work in close to snags, losing lures but hooking more fish. If trolling and you feel the lure hitting snags or the bottom, you have got it right. Use lures that dive to the depth your sounder shows. Bibbed lures that float when stationary are good for trolling as they bump over snags, floating up when line is released. Sinking lures can be dropped beside deep snags. Towards the end of the dry season, about September, as the weather warms in the build-up to the wet season, barramundi become aggressive and fishing improves tenfold. September, October and November are great fishing months, although the noon heat and afternoon storms put some people off. The monsoon hits in December, when westerly winds and driving rain see most fisherman preparing their gear for the year ahead. Barramundi often feed best at night, and in the early morning and late afternoon. They can easily find a lure in complete darkness. Despite the fish’s large size, small lures fitted with strong hooks often work well, especially during the run-off when tiny bait abounds, and when tiny prawns fill the estuaries. 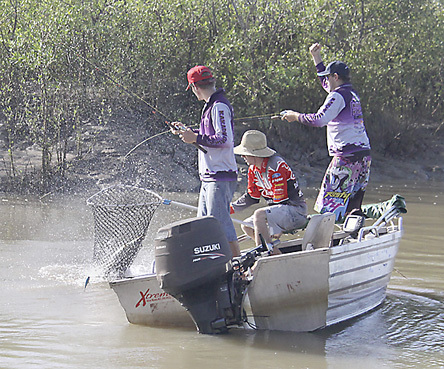 You can catch barramundi without a professional guide, using your own boat. It is hard work, but a lot of fun at the same time. Click the link for more information about DIY barramundi fishing. Meanhile, check out some barramundi fishing videos.